When disk space gets tight, don’t start deleting your precious files. Avast Cleanup Pro for Mac scans your hard disk for hidden junk files, finds duplicates you never knew about, and keeps your Mac running smooth. In the hidden depths of your hard disk, macOS and your apps create thousands of temporary files and cache data they need to work — and then forget to delete. 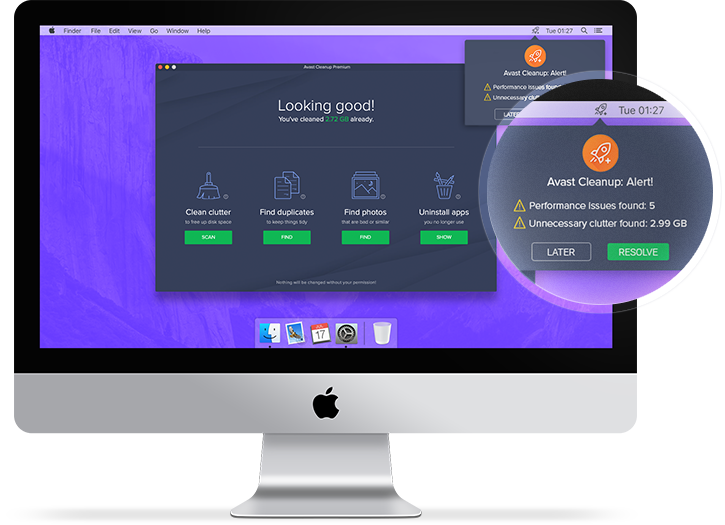 This is where Avast Cleanup Pro for Mac jumps in. We deep-scan your Mac and delete what’s no longer needed. MacOS and 3rd party applications automatically create temporary files, which aren’t critical but waste lot of drive space. They include leftover data from applications you may have uninstalled ages ago or programs like Xcode or Safari. Safari®, Chrome®, and Firefox® browsers store non-critical temporary files and cookies in a cache folder. Deleting this cache not only frees up drive space, but can help protect your privacy. Applications create logs to record normal operation or how they crashed. In most cases you won’t need them, so why keep them? Trashing files doesn’t delete them. Get rid of the forgotten files in your macOS recycle bin. System files that macOS adds to external files formatted for other operating systems. These files can be safely deleted to free up space. Working with lots of documents, photos, videos or downloads? Then you know all about hard-to-find duplicate files scattered across your disk. Bring order to your Mac: find all your duplicate files and delete the ones you don’t need. What do you mean, “clones”? It happens to the tidiest of us: You download a file twice, you forget about a copy of a photo you’re editing, you back up that huge video project... Duplicates creep onto your Mac every day and before you know it, you’re wasting gigabytes of disk space on clones you no longer need. Our Duplicate Finder deep-scans your disk to find duplicate documents, pictures, songs, videos, folders, and other files. Use file size, date, and our preview to decide which clone you need — and which you can get rid of forever. No need for a chore day: Get regular alerts when there’s clutter to clean on your Mac — and remove it with just a simple click. We’re not demanding. All you need is a Mac running macOS 10.10 (Yosemite) or later with at least 68 MB of disk space. An Internet connection is also required for automatic updates.